Fresh from collecting a whopping 86 medals at the Abu Dhabi World Games – the Olympians along with thousands of volunteers dotted around the country are looking to raise much needed funds for the future champions. Part of this will be to help develop the Young Athlete programme in Ireland where 175 children aged between 3-7 are getting involved and improving their motor skills with a view to getting involved in the country’s Special Olympics programme’s when they turn eight-years-old. “We were delighted to set up a programme, we ran it as a pilot in June at the Ireland Games and since then there’s been such demand for it,” Special Olympics Ireland CEO, Matt English told Independent.ie. He said it’s “like a crèche for sports”. More than 2,000 children have an intellectual disability in Ireland. Speaking in Abu Dhabi last month where the Young Athletes Programme was being showcased by Emirati children, Special Olympic Ireland Director of Sport, Karen Coventry said the demand is picking up in Ireland with five regions now involved. “We’re looking here, stealing some ideas to bring back home,” Ms Coventry said. “The aim of the programme is the fundamentals and the ABCs of sport, so it’s agility, speed and coordination and it prepares them for sport when they get older, they play football, they know how to throw, how to run, how to catch,” she added. 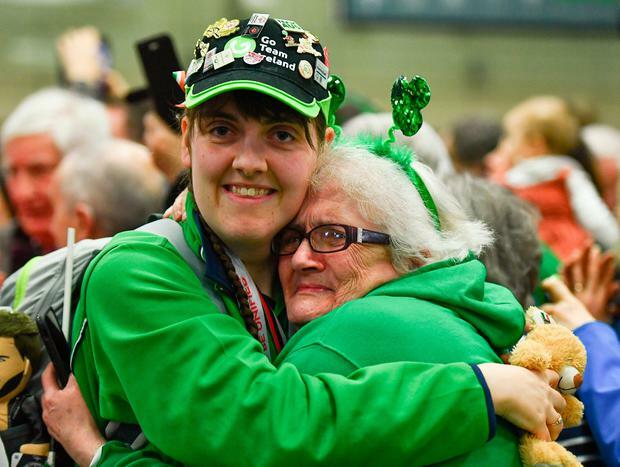 As for today, Special Olympics volunteers are in all four corners of the country, across 600 locations, hoping to raise around €500,000 to cater for around 8,000 athletes in Ireland. Long-standing volunteer, Brian O’Callaghan from Limerick has helped out in both LA 2015 and Abu Dhabi this year said he has seen first hand the benefits the Special Olympics movement has had. “I've been volunteering for Special Olympics Ireland since 2014. My son Padraic was born with Down Syndrome in 2010 when the Ireland Games were on in Limerick and I was so inspired. It gave us hope for Padie’s future,” he said. “I’ve since volunteered at the World Games in LA and Abu Dhabi and the Ireland Games in Dublin, and every Collection Day, I'm also out shaking a bucket on O’Connell Street in Limerick, playing my part in supporting our future champions. “I would encourage everyone that encounters a volunteer this Friday to please give generously, or jump online and make a donation, however small. I have seen first-hand the positive effect Special Olympics has had on these athletes and their families,” he added. Show your support today by texting Athlete to 50300 to donate €4.